Vermont’s largest city – and only city of any size – lies in a beautiful location on a hillside overlooking Lake Champlain and the skyline of the Adirondack mountains, on the opposite shore in New York. The thriving downtown reaches right to the shore, but its main shopping district is a few streets above on Church Street. There is almost always something happening in this broad, car-free space lined by shops and restaurants. Crowning the hill is the stately campus of the University of Vermont, which gives Burlington a young, hip vibe. Don’t expect a big city, but do expect to find a high concentration of arts and cultural attractions, as well as plenty of active options for tourists to enjoy. Burlington has a large population of artists and high-quality craftspeople, whose works you’ll see in the many galleries and studios throughout the city and surrounding towns. The Flynn Theater is a magnet for top national and international performers and music, and Burlington is home to the Vermont Symphony Orchestra, as well as music and theater groups at the university. On the outskirts of Burlington, this large, open-air museum gathers original buildings from different eras of Vermont’s past into a campus that doesn’t pretend to be a real village, but shows each house, barn, and shop with period furnishings and the activities of rural life in its time. The 39 historic buildings, even the historic lake steamer SS Ticonderoga – hauled here by rail and restored, are either furnished or used as display settings for some exceptional collections of decorative arts, paintings, folk art, and Americana. 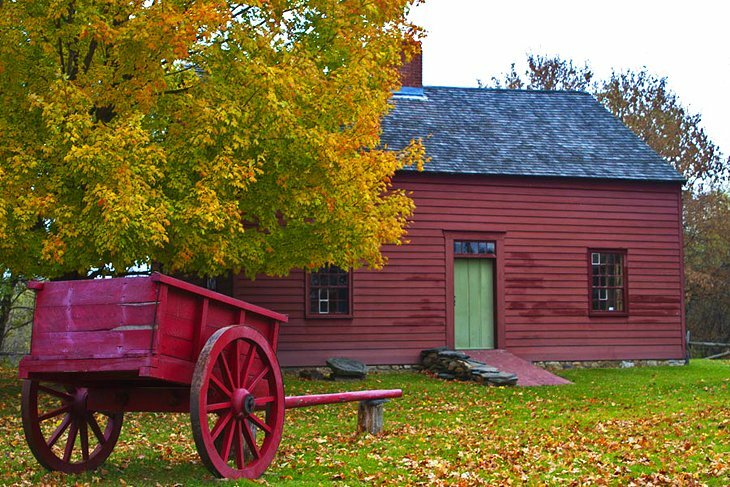 The grounds include a railroad depot, private car, and locomotive, covered bridge, jail, print shop, apothecary, schoolhouse, country store, meeting house, lighthouse, and a round barn, one of the few to survive in New England. The two-room log Settlers’ House shows Vermont life in the 1790s, with an open hearth fireplace, furnishings, and a vegetable garden. The reproduction barn houses demonstrations of early crafts and cooking. Particularly outstanding among the collections are rare hatboxes, quilts, hooked rugs, costumes, decoys, tin and woodenware, 18th-century English furniture, and paintings. The latter represent not just American artists, but include the French Impressionists and even Rembrandt. An entire horseshoe-shaped building was constructed just to display a 500-foot-long handmade circus parade. 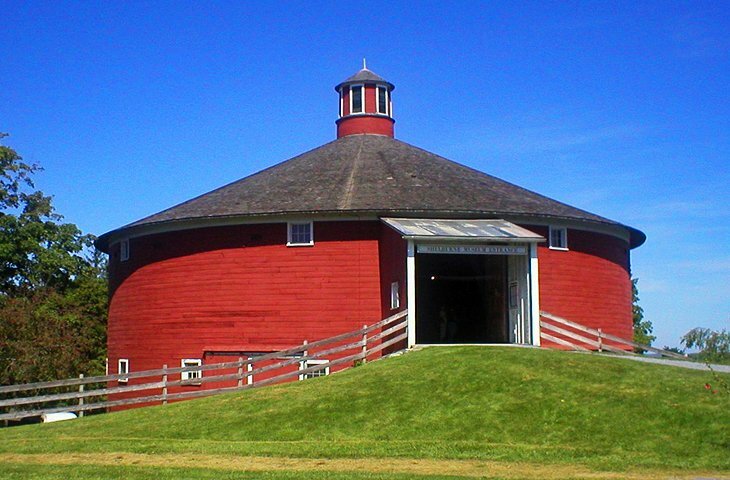 The round barn is used to showcase special exhibits. Lake Champlain stretches in a north-south line between Vermont and New York, with a small portion of the northern end in Canada. Its width varies from less than half a mile to 12 miles, and most of its waters are in Vermont. Spirit of Ethan Allen III offers sightseeing cruises on Lake Champlain with a narration on the Revolutionary War and other periods of the lake’s history. Lake Champlain´s largest cruise ship, at 140 feet long, it can carry 363 passengers, and along with several daily sightseeing cruises in season, it offers lunch and dinner cruises, even occasional dance cruises. Other boat excursions from Burlington’s downtown docks include daily sailing cruises and longer private charters on the classic sloop Friend Ship. 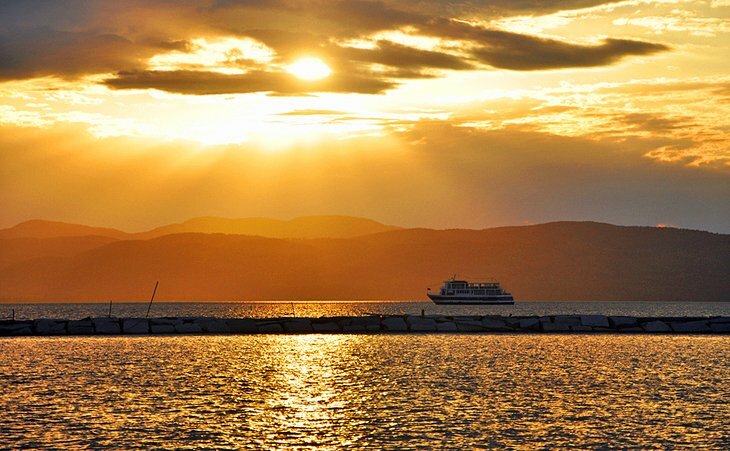 Ferries cross several times daily in the summer and fall, between Burlington and Port Kent, NY, offering beautiful views of the mountains and lake. The ferry crossing takes about an hour. Although it’s only four blocks long, Burlington’s Church Street packs plenty of action into its short length. The traffic-free street is wide enough to accommodate large gatherings of people for the many festivals and events throughout the year, as well as providing plenty of space for cafés and restaurants to spill onto the pavement, creating the air of an Italian piazza. Overlooking the street from the upper end is the church it’s named for, the First Unitarian Universalist Church. Notice the granite line in the brick pavement, with stones engraved with cities around the world that lie close to the same longitudinal line. Permanent public art works include a life-sized statue of local jazz artist Big Joe Burrell; a sleek metal Fish Fountain; and a mural, Everyone Loves a Parade! by Canadian muralist Pierre Hardy. 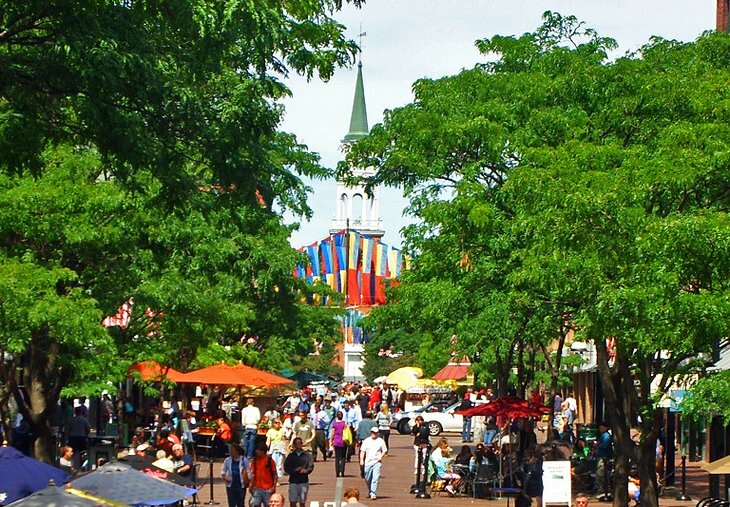 Listed as a National Register Historic District, Church Street has also been named one of the Great Public Spaces in America. 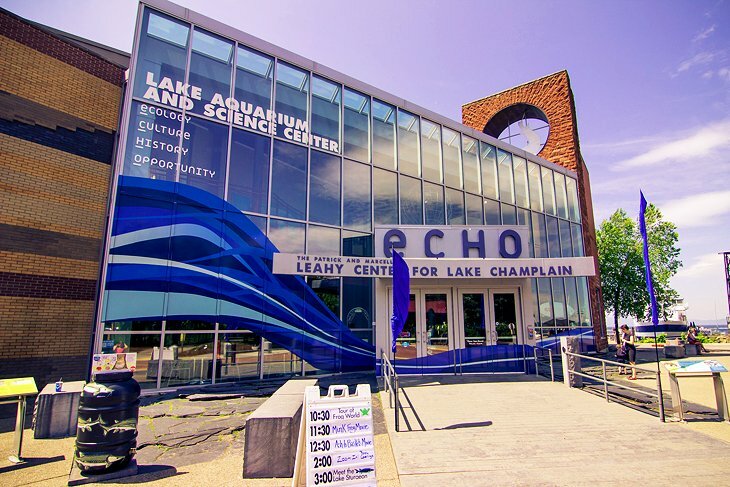 The ECHO Lake Aquarium and Science Center, at the shore of the lake, features the natural history of the area as well as the historical heritage of the Lake Champlain area. Permanent exhibits, many of them interactive, appeal to all ages as they explore the depths of the lake, showcase 15 frog species from six continents (including the world’s most poisonous frog), and explore the geology of the Champlain Basin and the people who have lived in the region throughout history. Kids can see themselves on TV at the exhibit, Be a Watershed Weather Reporter, and young children have a hands-on discovery center all their own. The award-winning “green” building offers panoramic views of the Lake and Adirondack Mountains from its deck. Next to ECHO is the Lake Champlain Navy Memorial in the Leahy Center for Lake Champlain’s Hoehl Park. On the University of Vermont campus, the Robert Hull Fleming Museum of Art features more than 20,000 objects in collections covering American, African, European, Ancient Egyptian, and Middle Eastern art, as well as work by Vermont artists. African artifacts represent the continent through sculpture and other media and include contemporary interpretations of traditional forms; the more than 400 ancient Egyptian objects include a mummy and coffin. American art is especially strong in 19th- and 20th-century landscapes and works by artists active in Vermont since the mid-19th century, such as Audubon, Bierstadt, Winslow Homer, and Andy Warhol. European art is represented by Corot, Daumier, Dürer, Goya, and Rodin. More than 2,000 objects from Native American cultures include bead- and quillwork, Southwest ceramics and baskets, masks from the Northwest Coast, and carvings. The Pre-Columbian collection is known for its ceramics, textiles, and stone carvings. Main Street rises steadily from just above the lake shore to the hilltop campus of the University of Vermont (UVM), founded in 1791. Burlington’s prosperous merchants and leaders built their stately homes and mansions on the upper slopes, above the commercial and waterfront areas, and many of the finest of these have been preserved and maintained as residences and as part of the smaller Champlain College. Follow any of the streets to the right or left of Main Street to see examples of several architectural styles, mostly built in the latter half of the 19th century. 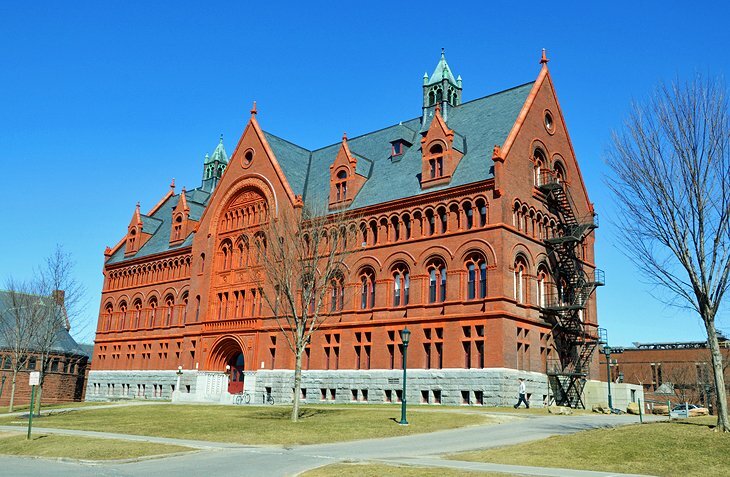 Crowning the UVM campus is the ornate Williams Science Hall, a massive brick building with a granite block foundation. On 1,400 acres of land north of the city is the farmhouse that was the home of Revolutionary War hero, Ethan Allen. Allen and his brother, Ira, were landowners under New Hampshire grants, which they defended ardently against New York’s attempts to claim. In the end, neither state could establish its authority, and the residents finally formed the Republic of Vermont, which later became the state. So along with being a hero of the Revolution, Allen became something of a folk hero in Vermont. His home has been restored, and other farm buildings house archaeology and history exhibits. Hiking trails throughout his land have signage to explain the natural environment. In the adjacent Ethan Allen Park, an observation tower reveals views over Lake Champlain and the surrounding area. A wide green swath of park with a bike path and promenade borders the lake shore, stretching some distance to the north and south of the town landing at the bottom of College Street. Near the docks, look for Vermont’s only All-America Display Garden, where the newest varieties of flowering ornamental plants bloom all summer. Waterfront Park is popular for running, cycling, walking, picnicking, and for frequent festivals throughout the summer and fall. Above the shore, Battery Park lies at the top of Battery Street, marking the site of the battery built there in 1812. From this position, U.S. artillery fought British ships on Lake Champlain in August of 1813. Luxury Hotels: A block from pedestrianized Church Street and close to lakefront parks, Hotel Vermont is hip, modern, minimalist, and green, with a strong use-local ethic. In a residential neighborhood of distinguished homes between downtown and the university, retro-chic Made INN Vermont includes complimentary snacks and a full hot breakfast. Hilton Garden Inn Burlington Downtown is a block from Church Street and next to the Flynn Center, with valet parking and a pool. Mid-Range Hotels: Beyond the university, near I-89, Sheraton Burlington Hotel & Conference Center has free shuttles to the airport and downtown and is a handy base for sightseeing in the Lake Champlain region. It has a large indoor pool and fitness area. A block from pedestrianized Church Street, Courtyard Burlington Harbor has large rooms with lake views. On the same hillside, Hilton Burlingtonhas a large indoor pool and sweeping views to the Adirondack Mountains. Budget Hotels: South of downtown and convenient to lakeside parks and the Shelburne Museum, Smart Suites Burlington has kitchenettes, free breakfast, free parking, and several nearby restaurants. Comfort Inn & Suites South Burlington is at the I-89 interchange, just past the university, with balconies, full kitchens, free breakfast and parking, an outdoor pool, and airport shuttles. On the road to Shelburne and close to the lakeside parks, Travelodge South Burlingtonhas good-sized rooms with mini refrigerators and microwaves, as well as free Wi-Fi, breakfast, and parking. West of Burlington, the land rises to the Green Mountains, over which you can cross the steep, winding road over Smugglers’ Notch. Closed in winter, when it is impossible to maneuver plows over the top, the route is one of the most interesting in the state. At the top of the pass, which is not far below the summit of Mt. 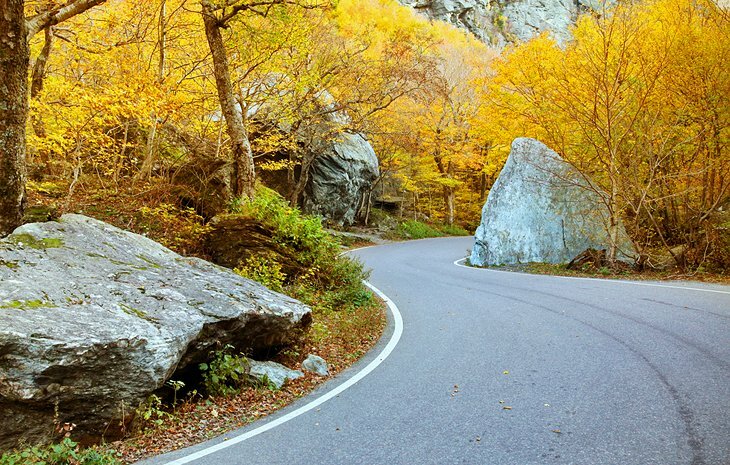 Mansfield, the narrow road weaves among giant boulders. Park between the boulders, if there’s a spot free, and climb a short distance toward the treeless summit for sweeping views to Canada and the Adirondacks in New York. During the Jefferson trade embargo, from 1808 through the War of 1812, northern Vermont farmers defied federal agents and carried their products over the notch to sell in Canada, accounting for the name of Smugglers’ Notch. Today, the notch is best known for the Smugglers’ Notch Ski Resort, always listed as one of the top family ski destinations in the country. 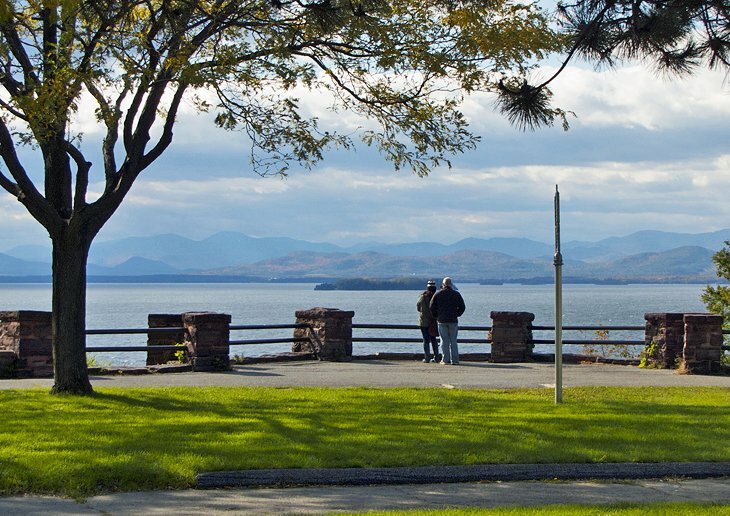 The Lake Champlain Islands, connected to each other and to the mainland north of Burlington by causeways and bridges, are summer recreation areas with beaches, campgrounds, and state parks. The irregular coastline of the islands creates a number of bays that are favorites for kayaking. The gently undulating landscape is known for its apple orchards, and has the longest growing season in the state, thanks to the moderating influence of the lake. 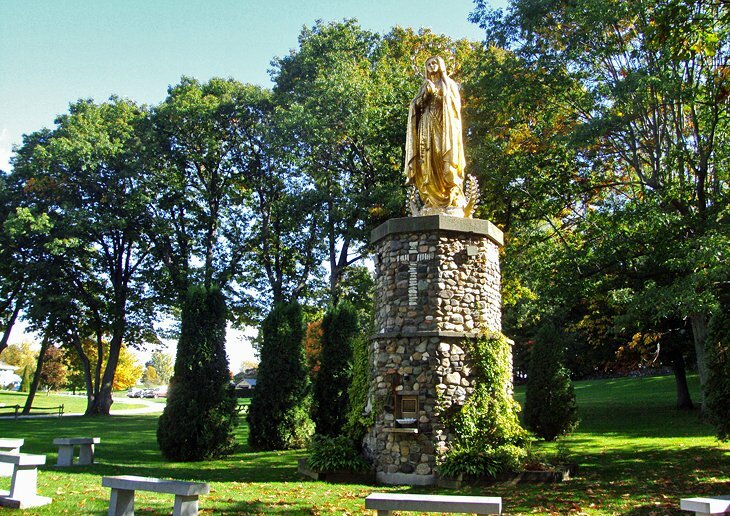 St. Anne’s Shrine on Isle La Motte is at the site of Fort St. Anne, and there is also a statue of Samuel de Champlain on the island marking the spot where he supposedly landed in 1609. One of the favorite things to do in Burlington in the winter is to head for one of Vermont’s many ski areas, which – along with the ski resorts in neighboring New Hampshire – offer some of the best skiing in the Eastern United States. In the summer, Vermont’s Green Mountains are favorites for their many hiking trails. From Burlington, the views of the Adirondack Mountains in New York may tempt you to cross Lake Champlain, and just to the north is the border with Canada’s French-speaking province of Quebec. The vibrant city of Montreal is less than a two-hour drive from Burlington.